Thrawn: Alliances picks up on the story kernel that Timothy Zahn planted in his 2017 novel Thrawn. With the casual mention that the blue skinned Chiss once met Anakin Skywalker in the Unknown Regions, this book fully fleshes out that adventure, and carries onward. Not only do fans get a Thrawn and Anakin story investigating a Separatist plot during the Clone Wars, but a Thrawn and Vader story set during the rise of the Empire. With the Chiss Grand Admiral joining forces with the Dark Lord of the Sith, it’s a volatile alliance that threatens to explode just as much as succeed. Essentially it’s two stories in one with the bonus of Padmé being in the Thrawn and Anakin adventure, thus giving fans a lot to look forward to. The book opens with two prologues, one for each time period, thus setting up the two stories. The first one beings with Palpatine, Vader and Thrawn as the Emperor gives them a mission in the Unknown Regions. He tasks them with going to a planet named Batuu to deal with a disturbance in the Force. The second prologue involves Padmé telling Anakin that she’s received word from one of her handmaidens that there’s something going on in the Batuu area. This part of the story is set during the Clone Wars, sometime after Ahsoka’s departure from the Jedi Order. Once both prologues are set, the book starts with the Vader/Thrawn story, and eventually alternates between the two. The book does a good job of not jumping around too much, so it’s never confusing keeping things straight. It also helps having Anakin and Vader as anchor points for each timeline, clearly delineating which era you’re in. The two stories also build upon each other, with there being some connections and relevance between the two. At the heart of each story is a bit of a detective/mystery plot. Whether it’s Padmé trying to find out what happened to Duja, or what Duja was investigating, Anakin trying to track down Padmé and teaming up with Thrawn to figure out what is going on, or Vader and Thrawn trying to discover the disturbance in the Force that the Emperor felt, there’s a lot of investigation and mystery as the characters look for clues and put together the pieces. Zahn is careful to keep that mystery going so the reader slowly gets a better idea of what is going on as the stories progress. Eventually there’s some action as the characters encounter strange alien species and some more familiar bad guys in the way of the Separatists. Each story has its own payout as you find out what is going on as each one is different. On one hand there is the mystery of what secret project the Separatists are working on, and on the other hand is the mystery of the disturbance in the Force. Each story also has some nice ties to the greater Star Wars universe. The Anakin/Padme/Thrawn storyline builds on the Clone Wars era. The Thrawn and Vader story builds on the mystery of the Unknown Regions, the mystery of the Chiss, and the goals of the Emperor. There’s even some things that might build on the First Order, Snoke, and their activities in the Unknown Regions. And with the inclusion of Rukh, it ties into Star Wars Rebels a bit. Overall, the book does a good job of presenting a nice, self-enclosed series of adventures that feels like Star Wars and includes fan favorite characters. It’s a book that slowly ramps up, and eventually hooks you with the elusive answers of what’s going on with the building mystery elements. With the inclusion of Thrawn, Anakin, Vader, and Padmé, the book has a lot to offer, with some team ups we’ve never seen before. 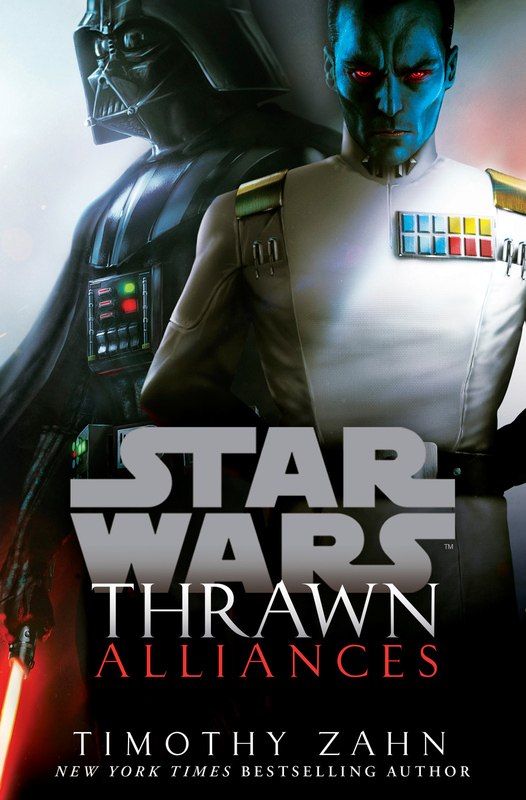 For fans of those characters, Thrawn: Alliances is a great read, and I highly recommend checking it out. I give it a four out of five metal bikinis.